Danger! Squirrels Have a Plan!! Available for men, women, and children in many styles and colors. You can buy this shirt here. If you go to the main store (Yak Lab Shirts) this design is available in solid black, white on black shirts, outlines, and many other variations, too! 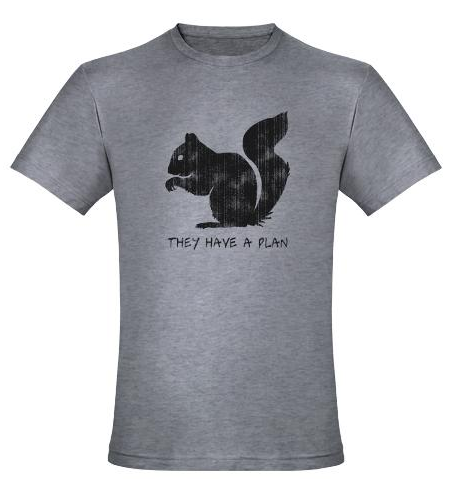 This funny squirrel image helps you warn the people of those rodents' nefarious plans. Yes, we always knew that there were sinister plans brewing as we listened to the scuttling of squirrel claws in the attic above our heads. They've been undermining our work ever since electrical wires became commonplace, gnawing away at our source of power. And they've been the bane of birdwatchers since the dawn of birdwatching time! The message is clear...squirrels are quietly, calmly plotting against us. And they have a plan. Now you can take that message to the street. Warn the people! Get this shirt!